Trusted Plumber in Copperas Cove & Killeen, TX & Surrounding Areas. Come to the Trusted Team at Patriot Plumbing for Lasting Results! Make Sure Your Repairs Last! Call Our Team for Insightful and Cost-Effective Service. Clogs Can Lead to Significant Damage in Your Pipes. Let Us Protect Your Plumbing by Cleaning Out Your Drains. Timely Repairs Make All the Difference! Schedule Your Appointment Today and Extend the Life of Your Water Heater! Leaky Gas Lines are Serious Business. Protect Your Family and Home With Our Professional Repair Services. Small Plumbing Details, Like Fitting Adjustments, Can Make All the Difference in Long-Term Functionality. When it comes to finding relief for your plumbing problems, would you rather have a short-term fix or a long-term solution? At Patriot Plumbing Service, we strive to provide our community with quality, lasting service. Don’t just take our word for it though! See what homeowners and businesses throughout the community have to say about us in our reviews section. If you’ve been hunting for local plumbers you can trust, give our team a call at 254-246-7913! Our courteous, insightful team would love to speak with you about any plumbing problems you may be facing, then get to work finding a solution. You’ll soon see why so many families and companies in the community choose us to be their go-to plumber in Copperas Cove & Killeen, TX. 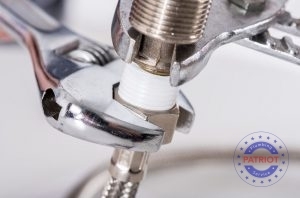 Our licensed plumbing experts at Patriot Plumbing Service can assist you with a wide variety of plumbing challenges. Our repair service starts with a thorough evaluation of the affected area in your home or business. After the source of the problem has been diagnosed, your personal plumber will talk with you about the most cost-effective options available. You’ll then be able to make an informed decision based on your family budget and functional needs. Below are some of the many services that we provide for the community. Our team at Patriot Plumbing Service understands that plumbing emergencies rarely wait for your convenience. Many breakdowns occur late at night or in the early morning. When you require fast relief in these out-of-office hours, you can contact us for a 24-hour plumber in Copperas Cove & Killeen, TX and nearby cities. The number to call for help is 254-246-7913. No matter what sort of challenge your sewer line is facing, it’s essential that it be resolved as quickly as possible. Leaks in the section of the pipe seep through the yard, creating an unpleasant smell and endangering your plants and animals. If your sewer line has become clogged, wastewater may even flow back up into the house. Contact us as soon as possible if you suspect a leak or clog! Is your faucet leaking, or has it stopped functioning altogether? Our friendly and insightful plumbers at Patriot Plumbing Service would be happy to help you repair or replace your faucet. Leaks here can be irritating, especially if you have stone countertops that are sensitive to the extra moisture. Whether the damage is located above or below the counter, you can expect lasting results from our faucet services! Give us a call today to arrange an appointment that works with your schedule. When your garbage disposal stops working, our team at Patriot Plumbing Service will help you get to the heart of the problem quickly. Whatever the issue may be, you can count on your personal plumber for insight! Our local professional will work with your budget to find the solution that works best for your family, whether that be simple repairs or replacement. Contact our team today and tell us about your problem! Whether it’s outside or inside the house, a single busted pipe can turn your day upside down! If you’ve detected a leak, or you suspect there may be one somewhere in your home, contact us and ask for an experienced plumber as quickly as you can. This will help us limit the amount of water damage inflicted to the area. Should the leak be spilling a substantial amount of water, you may need to shut off the water supply. We’ll repair the pipe or replace the section with brand new piping. Try to keep the age of your complete piping system in mind. If your house runs on a system that’s old and frequently leaks, it may be time to consider whole house repiping. Our licensed experts will be able to determine whether or not that’s necessary, and they’ll provide you with cost-effective options. Contact our office today to schedule repairs for your home! One of the most serious challenges that homeowners can face, a slab leak can have devastating consequences if it goes too long without repairs. These leaks are created when pipes located within your foundation slab are damaged due to age or shifting ground. When the damaged pipes spill water into the surrounding foundation, the moisture infiltrates the rock and intensifies existing cracks. The resulting foundation damage puts your entire home in danger. If you’ve spotted water pooling into the yard by your house, or if water is seeping out from beneath the walls, your home may have a slab leak. In worse case scenarios, water may even come spilling through the floor inside your house. If you detect any of these symptoms, be sure to contact us as soon as possible and ask for your repair plumber. We’ll talk with you about the repair process and your best options for fixing the damage. One of the few water appliances that is always running in your home, your water heater gradually starts to wear down over the years. That’s why consistent maintenance and occasional repairs are so crucial! At Patriot Plumbing Service, we provide affordable services to extend the life of your existing heater. Our licensed plumbing professional can also replace your water heater when it nears the end of its lifetime. Not sure whether your water heater needs repair or replacement? Give our team a call and schedule a quick inspection of your system! Your personal plumber will help you start planning maintenance and/or your future replacement. Another crucial part of your plumbing system, your natural gas lines provide valuable fuel for your stove, oven, water heater, and other appliances throughout the house! 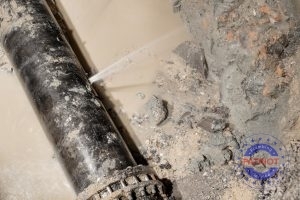 When a gas line or connection is damaged, however, it exposes your home to potential fire. The released carbon monoxide can also produce harmful physical effects for your family and pets. If you’ve noticed a discrepancy in your gas bill, or if you caught a whiff of that tell-tale rotten egg smell, call our team immediately at 254-246-7913! We’ll make sure that your family members are safe and walk with you through the next steps. Our natural gas plumbers will be happy to answer any questions you may have about the subject. A Clogged Sewer Drain Pipe Can Lead to Both Leaks and Waste Water Backflow. There are all kinds of goo, gunk, and generally icky things that can dirty the lining of your drain pipes. On occasion, this leads to bothersome clogs that slow or completely stop your appliances from draining effectively. When that happens, it can lead to some unpleasant backflow. Clogs also create a buildup in pressure that may cause your pipes to burst. The resulting water damage can get expensive. When you need a dedicated Copperas Cove & Killeen, TX plumber to provide lasting relief for your obstructed pipes, we’re the team to call. Our long-term cleaning solutions, including hydro jetting, ensure that your pipes will be protected from clogs long after our plumber leaves your home. Learn how we accomplish this by talking with a member of our team. Call 254-246-7913 and schedule your drain cleaning today! Clogged Drain Cleaning Stubborn clogs can be frustrating to remove, but our experienced plumbers make it easy with the latest technology! Drain Repairs If your drains have been damaged by clogs or acidic chemicals, talk with our team about getting repairs. If you been searching for local plumbing contractors that provide results and are trusted by the community, Patriot Plumbing Service is here to help. We’ve served countless homeowners and businesses throughout the local community and we’d love to help you find the service you need most. When you’d like to arrange a service call for your home, or if you want to learn more about our many services, call us at 254-246-7913. We can’t wait to serve you! Updated on December 17, 2018 at 12:31 pm by Patriot Plumbing.